Christian artifacts would have been exposed, maybe we wouldn’t have to queue so long to get in. But as the Holy Father it says, it’s a fairly heterogeneous representation of humanity. And the museum reflects it. It is a renaissance museum. 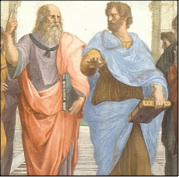 Also the entrance ticket you will receive has nothing to do with christianity but with humanity: We have the two main figures of the “School of Athens”, Plato and Aristotle, frescoed by Raphael. Those two philosophers, fully rediscovered at the beginning of the renaissance “the rebirth of the Ancient culture”, were fully understood by Cosimo de Medici. Inspired by Plato, he organized in his garden in Florence an “Academia”. And the Vatican Museum, originated in 1506 -before the catholic Reformation- reflects the spirit of those days. The humanistic reveal of that time made that not God, but man made after God, became central in philosophy and theology. That switch didn’t go easy. The enormous amount of pagan statues would also receive disdain of the popes of the Council of Trent. Speaking about the ancient sculptures in the Vatican collection, St. Pius V (1566-1572) judged them as “sunt idola profana”, they are “only mere profane idols”. Others ascribing this quote to the last non-Italian pope before John Paul II, Pope Hadrian VI, an austere Dutch pope of 1526. He wanted also reform the church by bringing it back to it’s origins. He came from the era where Martin Luther a few years before started his protest against the excesses of the Roman Court with the infamous Pope Borgia (Alexander VI) and his children. Hadrian VI threatened to sell off the whole collection, and in the interim built cabinets for them, locked the doors and kept the key to himself. Rome was not ready for such a drastic reform and he died within a year. Rumors were spread that he was poisoned. His immediate successors, like the Farnese pope Paulus III preferred the old style and acquired again a lot of ancient artifacts. Walking through the Museum, many artifacts have nothing to to with christianity but it is all part of the human history. The Egyptian sarcophagi were made long before Christ, but are part of the history of humanity. So, I would rather call it a Renaissance museum with a Roman Catholic dressing. The commune belief of the Renaissance is that man is made after God. The expression of this taught you find in the Library of the museum: Man is using his mind to develop Ideas. (Plato) On the other hand, man is made after the Creator with what he can do with his hands: sculptures, paintings, frescoes etc. (Physics - Aristotle) The whole museum reflects this duality. In 1506, a shepherd was walking over the Celio-hill in front of the Coliseum with his flock, when suddenly a sheep felt down in a hole. As a good man he went after it, and doing so he entered a cave, where on the ground were laying pieces of marble and some of the walls were frescoed. Returning in the open, he went to the pope, Julius II della Rovere and told him about his discoveries. The Holy Father knew something spectacular was going to happen. Therefore send his most beloved artist for having a look: Michelangelo. When he descended he saw the remains of a statue and .... recognized it immediately: it was the Laocoon as it was described by Plinus the Elder (2): The centre pieces of the Golden House of Nero. The frescoes, he called them “grotesque”, being found in “a grotta, a cave” under the ground. And he knew that the Golden House of Nero was found back. It was destroyed by Nero’s successors, it wasn’t on the forma Urbis, the model of the city made in 207. The importance for the history of the world of the Laocoon.
. An she said that everything you saw was from God. But however her looks may be, the Greek wanted Helena desperately back. Ulysses came on the idea to built a wooden horse with soldiers inside. The next morning, the Trojans saw the empty field and only a horse as present. “ Lets take it in”, they said. 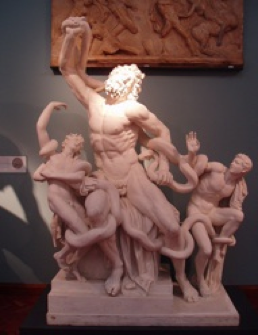 One man, the priest Laocoon, opposed against the gift by saying: “Never trust the Greek !”. (1) (We are 2700 years later and strangely enough we still can say the same about their economics ....). As soon he uttered his prophecy, a snake came out of the sea and took the priest and his sons away and drowned them in the sea. Next day Troy was destroyed by the Greek and the city was burned to the ground. Aeneas managed to escape with his father Anchises on his shoulder and holding his son Ascanio Julius by the hand. This boy held the family gods (penati) and the eternal fire in his hands. Exiled, they arrived in Latium (South of Rome). From there they walked over my road, the Via Latina, to the Palatine hill. Seven generations later a daughter of the family, Rea Silvia, a Vestal Virgin and responsible for the eternal fire, was giving birth to twins: Romulus and Remus, the founders of Rome. 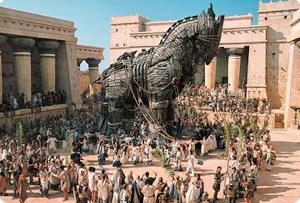 If the people of Troy would have listen to the priest Laocoon, the horse wouldn’t have entered Troy and the city wouldn’t have been destroyed, and more important, Rome would never have existed. The message is that you can’t change the destiny of the world by going against the will of the Gods. Laocoon wanted to change the history and was punished by the Gods and drowned in the sea by the the snake together with his two sons. And without Rome, we would never have had Julius Caesar who claimed to be a descendant of Aeneas. And without Julius Caesar there would never have been the emperor Nero, last member of the gens Giulia. Therefore, Nero looked at the statue as one of the center pieces of his golden house (Domus Aurea). And if Nero wasn’t there, the so-called “Christians” would never have been accused of starting it. And there would have no persecution under Nero of them. And if Rome wasn’t the capital of the Empire, Saint Peter would never had to come to Rome for the evangelization .... and would never have been crucified near the circus of Nero in 67 and been buried where is today the St. Peters Basilica. And Rome would never have been the capital of Christian faith. And then there would never have been Julius II, who started the collections of the Vatican Museum when this statue was found back. (here in a fresco of the rooms of Raphael in the Vatican, with Mr. Beam and on the very left Sylvester Stalone) And if the collection wasn’t there, you -our guests/tourists- wouldn’t come to Rome to view all the beauty of the Vatican Collection and the Sistine Chapel.....And I , poor man, would be unemployed as your guide. Yes indeed, this is a very important statue !! The reason why it was left behind in the golden House of Nero is due to the fact that it justified the Gens Julia, from which Nero was the last descendant in the line that started with Aeneas who left Troy with his son Ascanio Julius. The new family, the Flavi overthrew that line and buried ever reminder of it. So, the statue was mutilated (arms cut of) and left behind in the rubble of the Golden house until it was found back under the reign of pope Julius II. 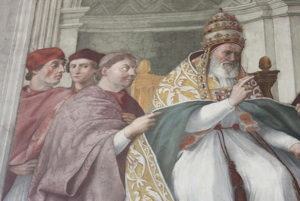 Of course, Julius II (image above, surrounded by a cardinal ?! 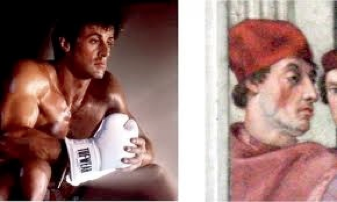 ... or is it Sylvester Stalone? )was more than happy to make that statue, so important for the Gens Julia, the start of his renaissance collection. (1) (418) In subtlety so he spake, his soul untamed by pain: for a brave man's part is to endure the uttermost. And of the Trojans some believed him, others for a wily knave held him, of whose mind was Laocoon, wisely he spake: "A deadly fraud is this". He said, "devised by the Achaean chiefs!" 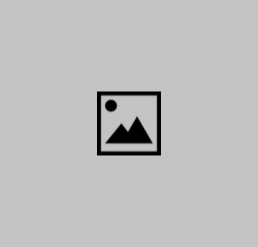 And cried to all straightway to burn the Horse, and know if aught within its timbers lurked. Quintus Smyrnaeus 12.